Last night I took my husband out of his 2 miles radius of the house comfort zone, down to the edge of Patterson Park to Three Restaurant. For me it was my 2nd visit, though my first time with former Pazo Executive Chef, Peter Livolsi as the top toque. There were a couple of tables filled, a hand-full of guests at the bar drinking and sharing food. We were lead to a premium table where we could look at the lower level guests without them seeing much of what we were doing. 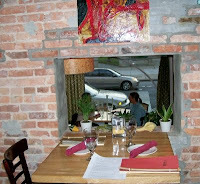 The décor, the exposed brick interior walls and contemporary art appealed to my senses. The menu has four pages: Salads Soups and Small Plates, Farmer’s Market Selection, Main Course and Cheeses. The time spent at Pazo by the chef definitely was reflected on the menu. The main courses looked intriguing with the introduction that evening’s entrée of mushroom risotto for 16; if also offered blacken venison, ground lamb kabobs, grilled pork tenderloin and the rib eye steak for two with a Romesco sauce and mango butter. This dish intrigued the prosciutto and melon eater in me and I must say it was a delightful twist. I enjoyed the contrast of flavors, the little spice of the coppa and the fresh ground pepper. I kept trying to get anything pistachio from the oil – possibly it was to subtle my taste buds. 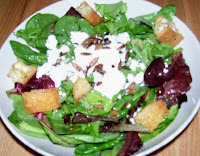 A small taste of the husband’s salad found the chilled greens crisp and the vinaigrette with sufficient acidity to balance the richness of the cheese. This was the first night for this item on the menu and after tasting it, I was kicking myself for not ordering it and jealous the husband had. The spiciness of the andouille and tasso contrasted nicely with the creamy garlic aioli. The sandwich was excellent and a good value size for the price. I could see grabbing one of these sandwiches and a good beer – food nirvana at the table or at the bar. The special selections for the evening were Thai mussels or calamari. My penchant for Asian food was not to be denied: so one order of the Thai mussel for moi. Aaah, the bowl arrived with many mussels, sliced green and red chilies and a hunk of grilled bread to sop up the wonderful liquid. 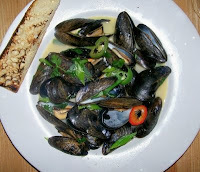 The mussels were cooked to perfection, moist and tender. For me, I found something lacking in the broth – maybe it was richness, the coconut milk too diluted, no chili flavor. I didn’t want to dunk my bread. Items in this section of menu change nightly or weekly – when the supply is gone it is what is fresh that day from the market. The three bruschetta rounds were generously topped with roasted peppers and onions with a hint of heat. The aroma of this dish had me salivating before it hit my mouth. The batter on the eggplant slices was light just enough to add texture though not overwhelm. Slices of fresh, ruby-red tomato were sandwiched with the cheeses. Hubby couldn’t keep his fork out of my plate. I really enjoyed this dish but wanted a bit more umph, so I asked for freshly ground pepper. The waitress recited the three dessert choices and confirmed that all were made in-house. The options were a chocolate and peanut butter mousse duo, a banana and pineapple dessert with rum sauce and sheep’s milk yogurt with lavender. My option was the banana and pineapple dessert but conceded to the husband on the mousse duo. Do you remember the Reese’s television commercial where “you got chocolate in my peanut butter and vice versa?” This dessert was reminiscent with the two flavors being divided by with the “I dare you to cross the whipped cream line.” Yes, we mixed it up a bit, some chocolate and peanut butter together and some plain. 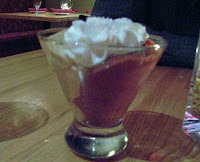 The mousse was airy, sweet but not overly cloying. The husband cleaned up every last fluffy morsel. A presentation note, I’m not sure if the waitress forgot to put a plate under the dessert or they were just serving it in the glass. The dessert seemed lonely or needing something to balance it out – I’m having a feng shui moment. Value versus quality – it was a good meal, old favorites and new ones to add to my list. The main question is would I go back, and my answer is yes. Footnote: My husband was hungry upon arrival and was taken back that there was no lavosh, bread, or cracker brought to the table, something to curb his hunger until our food would arrived. I can’t say if it was an oversight but I think the restaurant just doesn’t offer this amenity.